Millennium Chicago is located within the 3.8MSF Millennium Parking Garage under Chicago's spectacular Millennium Park. Millennium Chicago provides congestion-free truck dock and loading facilities and simple and easy access for small delivery cars and vans. Spaces will be customized to meet your company's specific needs including separately demised and secured space, ability to install coolers and/or other temperature controlled applications and a host of other improvements. The project is backed by an institutional landlord group that manages over $137 Billion in assets and therefore has the ability to fund and implement any worthy tenant improvement program. 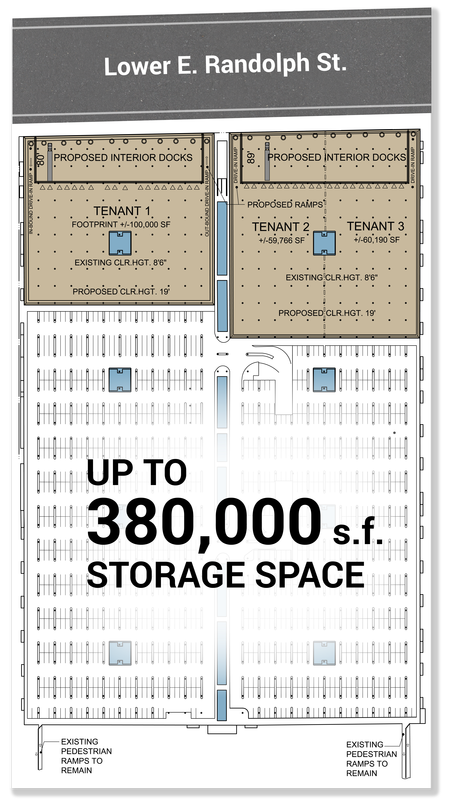 Units can start at virtually any size and go as large as 300,000 s.f. or more. The project team looks forward to exploring how we can help you and your company get closer than you ever imaged to your customer. Providing faster and more efficient last-mile delivery to both daytime and evening populations than from any other location in the city.